Close Your gift to "Where Most Needed" equips Samaritan's Purse with the resources—including personnel, materials, supporting services, buildings, and equipment—to fulfill our mission of relief and evangelism worldwide. Close Samaritan's Purse is airlifting emergency shelter materials and a team of disaster specialists, including medical personnel, to provide help in Jesus' Name to areas of Mozambique devastated by deadly Cyclone Idai. Close Samaritan's Purse is helping to meet the overwhelming physical and spiritual needs of the many Venezuelan residents who are daily entering Colombia. This may be the largest migrant crisis in Latin American history, and we have a number of projects running, which include primary medical care, feeding, backpack distributions, and a Center of Hope. As we serve, we are pointing men, women, and children to the eternal hope found only in Jesus Christ. Close Samaritan’s Purse is helping meet physical and spiritual needs for impoverished families struggling to recover in the wake of ISIS violence. Our programs are opening doors to share the Good News. Close Samaritan’s Purse is helping people in South Sudan through projects that include emergency aid for victims of violent conflict; drilling wells to provide safe, clean water; distributing food and farm supplies to fight hunger and malnutrition; and building up communities through education, vocational training, agriculture, and Christian ministry. Close Samaritan's Purse is responding to a major Ebola outbreak in the Democratic Republic of the Congo. We have established an Ebola Treatment Center where we are providing expert and compassionate clinical care in Jesus' Name. Your gift supports this lifesaving work. Close Jesus reminds us that the Kingdom of God is filled with people who have childlike faith. “Let the little children come to Me, and do not forbid them; for of such is the kingdom of heaven” (Matthew 19:14). We praise God that more than five million children have made decisions for Christ through The Greatest Journey. When they graduate, we present them with the New Testament in their own language so they can continue to grow in their faith and share Jesus with friends and family members. Your gift of $6 per child will enable us to train local volunteer teachers and provide all the materials for the 12-lesson course, including the graduation Bibles. Close Through our Operation Christmas Child project, God has given us unparalleled opportunities to touch the lives of millions of boys and girls in over 150 countries. Many of these children have never received a gift and never heard the true meaning of Christmas—until they open shoeboxes filled with gifts from people like you. Some of these gifts are packed by young children or people on fixed incomes who simply cannot afford to include the $9 we request for international shipping and related costs. When you adopt a shoebox, you are partnering with them to deliver their gifts and show God’s love to a precious child. Close The new cardiothoracic center at Tenwek Hospital in Kenya will be an 80,000-square-foot, 100-bed facility serving patients across East Africa and beyond. With six new operating theaters to be built, this project will increase the hospital's capacity to perform critical heart surgeries and other pressing procedures, including operations for those with cancer of the esophagus. In addition, this long-time medical partner of Samaritan's Purse will add 70,000 square feet of ancillary buildings to support personnel training on campus. Close World Medical Mission was established in 1977 to assist general surgeons who wanted to volunteer for short-term mission trips. Today, hundreds of volunteer Christian physicians, dentists, and other medical personnel work in mission hospitals and clinics around the world. We also staff a biomedical department and warehouse that provides critically needed equipment and supplies to these medical facilities. Close Tragically, hundreds of young mothers and thousands of newborns die every day from preventable causes. Your gift can help Samaritan’s Purse reduce the mortality rates of women and their young children by improving obstetric care, teaching essential nutrition practices, and increasing access to quality healthcare. Close One way we help in disaster situations is by handing out “family survival kits” that include warm blankets, buckets with water filters, cooking utensils, soap, and other daily essentials. For just $45, we can provide a lifeline to a family that has lost everything, to help them get back on their feet. Close Samaritan’s Purse is providing emergency food and other supplies to refugees in the Kurdish region of northern Iraq who have fled the conflict in Syria. Close Your gift of any amount can help Nigerien believers as they struggle to rebuild their churches destroyed by Muslim mobs in early 2015. Our goal is to help communities reconstruct dozens of houses of Christian worship, each costing about $10,000. Close Make your $9 per box donation online and you will receive a special barcode label that enables Samaritan's Purse to track each shoebox to its destination country. Close Samaritan’s Purse is helping people in rural, impoverished areas of Myanmar. Our maternal and child health program assists young mothers by teaching essential nutrition practices and improving obstetric care. Our teams are working to combat human trafficking through education and prevention programs. Your gift also helps meet desperate needs for water and sanitation projects, and other assistance. Close Samaritan's Purse mobilizes and equips thousands of volunteers each year to provide emergency aid to U.S. victims of wildfires, floods, tornadoes, hurricanes, and other natural disasters. In the aftermath of major storms, we often stay behind to rebuild houses for people with nowhere else to turn for help. Close A $35 gift can help us deliver enough food to sustain a family for a month. Close Samaritan's Purse responds to the urgent needs of families devastated by the wind, rain, and storm surge of catastrophic hurricanes. Whether in the United States or abroad, we come alongside hurting people to bring emergency relief and practical help in the Name of Jesus Christ. Close Samaritan’s Purse staff and ministry partners aim to bring practical help and the Good News of Jesus Christ to native peoples in Alaska and the surrounding region. Close Deadly flooding recently inundated much of western Japan. Samaritan's Purse has deployed a disaster assistance response team (DART) to help Japanese churches mobilize and coordinate volunteers who will assist families as they recover. Close We're glad you could join us for Living Proof Live and thank you for your interest in The Greatest Journey discipleship program. After children receive Operation Christmas Child shoebox gifts, many are invited to participate in this 12-lesson course that teaches them how to follow Christ and share Him with others. As they share their faith with friends and family, churches grow and multiply! Close Hundreds of thousands of refugees—many from the war-torn countries of Syria, Iraq, and Afghanistan—are streaming across Europe right now in hopes of building a new life. The conditions they face are difficult and put them at great risk in multiple ways. Samaritan's Purse is responding to this crisis—the largest of its kind since the Second World War—by providing physical relief and offering the hope of the Gospel to these displaced families. Close Jesus promises, “For where two or three are gathered together in My name, I am there in the midst of them” (Matthew 18:20). Samaritan's Purse assists Christian refugees who have been terrorized by ISIS, trains courageous church leaders in places where Bible schools are outlawed, and helps churches that have been bombed or burned. A 300-seat church costs as little as $15,000. That’s just $50 per person to establish a house of worship, a place of ministry, and an anchor for the Gospel. Close Samaritan's Purse is providing medical aid and other critical relief to the Rohingya refugees in Bangladesh. Close The World Medical Mission Post-Residency Program is a fully funded two-year program for Christian physicians and their families who have been called to medical missions. Following their residency, doctors are placed at a mission hospital to serve within their specialty alongside career medical missionaries. We provide logistical and financial support to these young men and women as they treat patients and share the love of Jesus Christ. Close Your gift can help Samaritan’s Purse reduce the mortality rates of women and their young children by improving obstetric care, teaching essential nutrition practices, and increasing access to quality healthcare. The physical relief we provide in the Name of Jesus Christ mobilizes our local church partners and earns them a hearing for the Gospel. Close Samaritan's Purse is working to improve the quality of life for thousands in the Philippines by providing clean water, hygiene education, and provision of latrines. We are conducting nutrition monitoring for infants and young children and training parents on better feeding practices. Our teams are also helping families recover their livelihoods through bamboo plantations and business training. We partner with the local church, supplying Bibles and offering discipleship courses to help them reach their communities with spiritual care and support. Close Learning a skill such as sewing, cooking, construction, auto mechanics, or some other trade can be life-changing, allowing vulnerable people ensnared in chronic poverty or at risk of exploitation to earn an income that can give them a new start at life. Close After her husband and sons died, Naomi felt so hopeless that she didn't even answer to her own name. She told friends in Bethlehem, "<em>Call me Mara, for the Almighty has dealt very bitterly with me"</em> (Ruth 1:20). But her daughter-in-law Ruth never abandoned her in her despair and eventually blessed Naomi with a grandson who became the grandfather of King David. Just as the Lord restored Naomi's joy, He is still working to sustain and redeem the lives of women who have been bitterly oppressed, marginalized, or impoverished. Our projects around the world support, protect, and bless vulnerable women in the Name of Jesus Christ. Your gift of $30 can help provide nutritional classes for mothers caring for their babies, or an outreach to protect women from abuse and exploitation, or vocational training for those who are determined to give their families a better life. Close Your $35 gift can help provide an orphanage with food, housing, healthcare, education, and other daily necessities, so that it can fulfill the mission of raising up children who know Jesus Christ as their Lord and Savior. “For in You the fatherless finds mercy” (Hosea 14:3). Close For $25, Samaritan’s Purse can furnish shoes, coats, and clothing for traumatized refugees, disaster survivors, and shivering children. Close When children are desperately hungry, they often need specially formulated food to save their lives and prevent lifelong problems. For just $9, we can provide a week’s supply of therapeutic or supplemental food so that a famished child can be nursed back to health and have a chance at a brighter future. Close For just $7 you can help show compassion to young boys and girls through a week’s worth of hot meals. Close Your gift goes towards building a one-room school that can make a difference for generations to come. Close A $75 gift can provide a child with daily necessities, safe shelter, counseling—and an opportunity to experience true freedom in Christ. Close A gift of $250 can supply specialized equipment, corrective surgery, or schooling to help a child overcome disabilities and begin to glimpse the life-changing power of God. Close Samaritan's Purse responds to medical emergencies in a variety of ways—through an emergency field hospital, a riverboat clinic serving remote Amazon villages in Bolivia, and the only hospital in a war-scarred state in South Sudan. Your gift will help bring expert treatment and the hope of the Gospel to victims of disaster or war. Close Samaritan’s Purse has provided emergency housing for tens of thousands of disaster survivors in places like Haiti, Philippines, and Nepal. These durable, easy-to-build shelters help open doors for our workers to share about the compassion of our Lord. “For every house is built by someone, but He who built all things is God” (Hebrews 3:4). Close Your gift can be used toward the costs of travel, meals, lodging, and outdoor activities for these husbands and wives as we work to help couples strengthen their marriages through the transforming power of God's Word. Close Your $125 gift can help provide education, vocational training, prevention programs, or other assistance as we show God's saving grace to those who are at risk. Close A gift of $125 can help our teams provide a family with water, food parcels, heaters, or other assistance as we seek to earn a hearing for the Gospel of Jesus Christ. Close The “language” of soccer and other sports can span cultures and continents, keeping children active and promoting teamwork while providing opportunities to share the life-changing Gospel of Jesus Christ. Just $8 can cover the cost of a soccer ball or other sports equipment to help local Christian leaders kick off an evangelistic sports ministry. Close Celebrate this Christmas with a gift of $5 to supply booklets for 30 children around the world, so they can learn about the reigning Prince of Peace. Close For $6, you can give a warm blanket that is a wonderful way to show how God’s love enfolds those who are hurting. Close Scripture tells us that when we reach out to help “one of the least of these” we are expressing our love for the Lord Himself: “I was hungry and you gave Me food” (Matthew 25:35a, NKJV). Samaritan’s Purse is working to meet the physical and spiritual needs of people around the world through several hunger relief programs, including therapeutic feeding for malnourished children and nursing mothers, emergency food distributions in crisis situations, hot meals for orphans and the elderly, and food parcels for families in poor neighborhoods. Close Your $14 gift can bless an impoverished family with an ongoing source of nutrition and supplemental income, all in the Name of Jesus Christ. Close The Children’s Heart Project identifies children with life-threatening heart disease in countries that lack technology and training, and matches them with North American hospitals and surgeons that donate their time and services. Close Samaritan's Purse provides families with an easy-to-use filter that requires no power or chemicals and can make contaminated water safe to drink for years to come. Close Samaritan’s Purse sends specialized teams to places such as South Sudan and Bolivia to provide outpatient surgery for hundreds of patients. Your gift of $250 will enable us to cover the cost of this life-changing procedure so we can show these boys and girls how precious they are in the eyes of God. Close For $20 per family, we can provide a daily source of clean water or help establish sanitation facilities and hygiene education to prevent the spread of water-borne diseases. Close A gift of $55 can provide hard-working farmers in countries around the world with training, tools, and seeds, while giving our staff and partners the opportunity to sow the Gospel in receptive hearts. Close Your gift of $50 will help cover the cost of simple eye surgery for someone who yearns to see, work, teach, or read the Word of God. Close We can drill or rehabilitate a village well for as little as $25 per family. Close Your gift of $100 helps us to supply Christian workers with a motorbike, bicycle, or other vehicle to carry the Light of the Gospel to some of the most remote places on earth. Close Just $70 can purchase a dairy goat or other dairy animal for a family in need. Close For just $15, we can provide five New Testaments, three Bibles, or other Gospel materials to suffering people who long to learn more about the One True God who loves them. Close For $80, Samaritan’s Purse can provide a sheep, llama, alpaca, or other wool-bearing animal and train families to care for their flock as we share the great love the Good Shepherd, Jesus Christ, has for them. Close A gift of $35 can supply the tools needed to open the eyes of the multitudes to the Gospel. Close Your gift can help cover the cost of protective suits for health-care workers in a place like the Democratic Republic of Congo and help us fight epidemic diseases like Ebola, malaria, and tuberculosis in other parts of the world. Close For $45, we can supply a poor family with 30 seedlings that can yield a harvest for seasons to come and encourage them to root their lives in the Word of God. Close Your $150 gift can help make it possible for the sick to experience physical and spiritual healing through the touch of the Great Physician. Close When we provide oxen for a hard-working farmer, we not only help him increase his harvest but also reap opportunities to share the Way of the Cross. Your gift enables us to provide an ox, donkey, or other livestock—or even a cart and a plow that will lighten the burdens of a farm family. Close It costs about $165 a day to support a Christian doctor and family on the mission field. Close A new home in countries around the world devastated by disaster can be built for around $7,500, giving families a place to welcome others and share the great foundation that comes from our faith in Christ. Close A gift of $50 can help provide nets and supplies or stock a pond for our fishing projects around the world. Close Thousands of people in South Sudan lack access to safe, clean water. Samaritan's Purse is helping by drilling wells, providing refreshing water for communities thirsting for hope. 5 Wells in 5 Days is a God-sized effort to raise enough support to drill wells for struggling communities, and reach those in need with clean water and the promise of a new life in Jesus Christ. Close Samaritan’s Purse provides seeds, tools, training, and other assistance to help communities transition from subsistence living to food security. Our programs help impoverished families become self-sufficient and combat chronic hunger. Close By improving farming techniques, increasing the productivity of livestock, opening up access to markets, and providing training in basic business skills, we help households and communities make the transition from subsistence living to income generation, securing a better future. Close The gift of an animal can completely revolutionize the way of life for a struggling family. They are able to not only help care for themselves, but they can also generate an income by selling products such as milk and eggs at market. As an added bonus, the first offspring are given to another family in the community to help spread the blessing. Close Samaritan’s Purse works in some of the most remote areas of the world, most of which are without doctors or hospitals. In these communities, people suffer needlessly—even die—from some of the most treatable diseases. A gift of $2,000 can train a health professional to deliver immunizations or other vital aid to families in need in the Name of Jesus Christ. Close Despite economic gains made during the past decade in urban areas, many people in the vast rural countryside struggle to meet basic needs. Samaritan's Purse continues to help the people of Vietnam by providing clean water, medical care, vocational training, and HIV/AIDS education. Close Samaritan’s Purse furnishes poor fishermen from Bolivia to Myanmar with new boats and nets so they can feed and support their families. As a result, our church partners have the opportunity to share the Gospel with many and present Bibles to those who come to Christ. A small fishing boat can be purchased for about $500. Just $50 can supply nets or other gear. Close A bite from one malaria-infected mosquito can be lethal in developing countries. The disease kills nearly 800,000 people every year, more than 90 percent of them children. A $10 bed net treated with a natural insecticide is one of the best forms of prevention. We also train and equip church workers to help their communities combat the spread of malaria. Close A cup of milk is a delicious source of essential vitamins, protein, and calcium, which are vital to poor children fighting malnutrition. Sadly, milk is hard to come by for children living in poverty. That’s why Samaritan’s Purse provides milk and other nutritious items to many schools, orphanages, and hospitals in impoverished countries. Your $4 gift can provide nutrition for a week. Close Children are the most receptive audience for the Gospel. 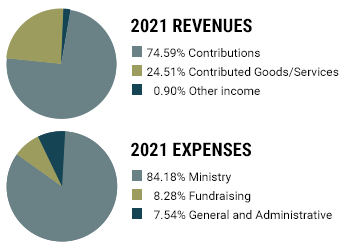 Samaritan’s Purse furnishes ministry partners in Asia, Africa, and Latin America with creative resources for Bible clubs, Christian camps, and other ministry programs to teach them God’s Word. “Train up a child in the way he should go, and when he is old he will not depart from it” (Proverbs 22:6, NKJV). Close In developing nations, a wheelchair is a treasure that few can afford. For as little as $75 we can provide a wheelchair for a crippled child or a man or woman who is struggling to accomplish even simple tasks around the home. A man in Macedonia named Vasil was overjoyed when he was fitted with chair that met his special needs. “For me, having a wheelchair is like having legs,” he said. Help Samaritan’s Purse offer hope and mobility to people in need in the Name of Jesus Christ. Close As Liberia continues to recover from years of civil war, Samaritan's Purse is helping thousands of people through clean water and hygiene programs, care for HIV/AIDS orphans, church renovation, a nutritional feeding program, and evangelism outreach. Close Samaritan's Purse continues to provide relief for victims of the earthquake that devastated Haiti. Our ongoing projects include food, water, medical care, orphan care, and livelihood programs. Close Samaritan’s Purse is making a difference in the lives of Kenyans, working alongside them on agricultural, animal, and forestry projects across the country. We also have a variety of projects focused on providing clean water that’s safe to drink. Since 1978 we've been sending medical doctors to Kenya through World Medical Mission, supporting at least two dozen hospitals that have helped tens of thousands of people find new life in Jesus Christ. Whether we’re on a farm or in an operating room, we are there serving in Jesus’ Name, demonstrating His compassion and declaring the hope of His Gospel. Close Samaritan’s Purse supports relief and evangelism projects that build up the ministry of local churches and mission groups in Israel, Lebanon, Jordan, Syria, Iraq, and surrounding nations. Close Cambodia, one of the poorest nations in the world, has few resources available to care for its people, the majority of whom live in rural areas. We help meet desperate needs for food and livelihoods through animals and agriculture projects, as well as providing access to safe, clean drinking water. Children’s education projects ensure boys and girls remain in school, while increasing their quality of life. Our maternal and child health program reduces the mortality rates of women and their young children by improving obstetric care, teaching essential nutrition practices, and increasing access to quality healthcare. We also combat human trafficking through education and training. Only 2 percent of the country is Christian, and a crucial aspect of our work involves partnering with local churches to help spread the Gospel in their villages. Close Niger is one of the poorest countries on earth, as drought and instability plague this West African nation. Samaritan’s Purse works to meet physical needs through livestock and agriculture projects, as well as monthly food distributions to tens of thousands of displaced people. Our community health programming educates families on gender-based violence and mental health issues. We also provide clean water through new wells and BioSand Filters. The filters are handmade and sold by local women who are able to earn desperately needed income. As we work across this Muslim-majority country to alleviate suffering, we partner with trained local evangelists to share the true hope found only in Jesus Christ. Close Nearly half of all children living in Bolivia's highlands suffer from anemia due to malnutrition. To improve the quality of life for children and their families, Samaritan's Purse provides agricultural production and livestock training, feeding programs at schools, and nutrition education classes to mothers. Meeting people's physical needs is coupled with teaching about the ultimate source of life and hope, Jesus Christ. Close Samaritan’s Purse is responding to instability in the Democratic Republic of Congo (DRC) by providing emergency food, water, shelter, and other assistance for thousands of displaced families. Close Samaritan's Purse, working in conjunction with local Christians, is meeting physical and spiritual needs in Mongolia through medical and evangelism programs. Close Over the years, Samaritan's Purse has opened doors for ministry in North Korea by distributing food, furnishing agricultural aid, supplying flood relief, improving medical facilities, equipping TB treatment centers, and providing mobile clinics. In the face of a looming food crisis, we will continue to reach out with practical help in the Name of Jesus Christ. Close These small animals cannot add or subtract, but these floppy-eared friends sure can multiply in numbers. Adult rabbits produce many baby bunnies, which a poor family can sell to pay for other necessities, such as clothes, shoes, or medicine. Your $20 gift can purchase a male and female rabbit, or go towards providing other small livestock such as pigs. Close Samaritan’s Purse assists our church partner in Lebanon in providing Bible instruction and ministry training to Christian workers from across the Middle East. Close Honeybees produce more than a sweet treat for struggling families. Honey and beeswax can be sold to pay for education, healthcare, or other needs. The bees also pollinate plants, increasing fruit and vegetable yields. As our teams provide farmers with beekeeping equipment and training, we are able to lead many to Christ. “We thank God for this project, because we came to know the Gospel of salvation,” said Jose Santos, a young father in Honduras. A $35 gift can help a family get started in the honey business. Close Through the HIV/AIDS ministry of Samaritan's Purse, Uganda has seen unprecedented success in the fight against this disease. In 1994, we launched a comprehensive program to strengthen the Christian response to the pandemic by mobilizing private, church, corporate, and government resources. We continue to provide training to church leaders, enabling them to bring unconditional love and hope to those who are suffering. Samaritan's Purse also is involved in community development, livestock and children's programs, and has provided food and other services for hundreds of thousands displaced by terrorism in the northern part of the country. Close Your gift goes towards providing a child with a quality education, school supplies, housing, nutritious food, and loving care at the Greta Home and Academy. Close Since 2002, Samaritan's Purse has worked in 42 countries, providing Biblically based programs to strengthen the international Christian response to HIV/AIDS. This ministry encourages individuals to seek counseling and testing, supports AIDS orphans and vulnerable children, and empowers churches overseas to teach their communities about the disease and promote choices that will keep young people out of harm's way. Close From Cambodia to Uganda to Honduras, Samaritan’s Purse has trained and equipped thousands of local believers to share Christ’s grace and truth in communities stricken with HIV/AIDS. Just $35 can provide a Christian worker with simple supplies, Gospel materials, or other resources to reach out to the hurting and hopeless.